Secret by secret, lie by lie, the girls get tangled in A’s dangerous web. A knows about everything, from their tiniest transgressions to the awful incident in Jamaica. Soon A will have enough ammunition to pull the trigger and end the pretty little liars, once and for all. . . .
Sara Shepard is the author of the #1 New York Times bestselling series Pretty Little Liars. She graduated from New York University and has an MFA from Brooklyn College. Sara recently moved back to Philadelphia’s Main Line from Arizona, where the Lying Game series is set. I can’t believe this series is almost done. I don’t know if it could have gone any longer, it’d be a relief for the friends to finally live a life without an evil A on their backs, but still… just one more book and the series is done. Except now the four friends have a huge problem at hand. A third evil A is out blackmailing them with all their dirty little secrets, and this time a fifth pretty little liar has come into the picture. Now that Spencer is visiting Princeton and dreams about joining an Eating club; when she meets a potential friend who could get her in, everything falls apart with the help of a little A. And Hanna is having troubling not turning into a stalker herself. She’s determined to win someone back no matter what. Aria is having her own boy trouble. She can’t decide whether to ruin her boyfriend’s image of his parent’s relationship or just lie about it even though they both agreed to be honest with each other. Emily is down in the deeps as well. She has her own fifth pretty little liar with her, and A is determined to rip her life apart. Stunning was an amazing roller-coaster ride that twisted all the way through. It was full of nonstop suspense that had me glued to my seat in excitement. 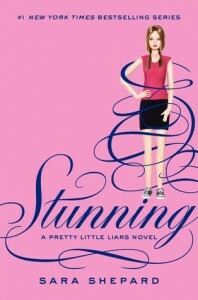 Sara Shepard’s writing flowed so smoothly that before you even knew it you where at the end. And by then I was left with an overwhelming urge to get on the ride again. The characters are lifelike and unique. They become friends once you join them on their adventures throughout the series. They don’t even feel like characters in a book anymore, it’s almost as if you’ve been friends with them your whole life. But I was disappointed in Hanna’s premature conduct. Running after a guy who rejected you and has a girlfriend is definitely not cool. She made herself an easy target. The plot was exceptionally thrilling. Even knowing the truth would keep you latched onto this book without hesitation. Shepard’s has a way of writing that grabs your attention entirely. She makes her books come to life with the amount of suspense she adds in them. She doesn’t describe surroundings as much, though, and it’s a little hard to picture the places, but the thrilling rush of excitement the books give you is enough. Overall, I really really enjoyed this book. It’s a fast-paced read that gets your heart pumping and your mind going. Who’s the real A? Who killed who? What’s going to happen to the girls? And suddenly the book just stops. I was left with a cliffhanger. My daughter, who is not a reader, loved this series. She’s read all of the books. That fact alone makes it worthy of high praise in my opinion. Thanks!